Marmot is the common name for the stocky, short-legged, diurnal, and typically short-furred and burrowing ground squirrels comprising the genus Marmota of the rodent family Sciuridae (squirrels). 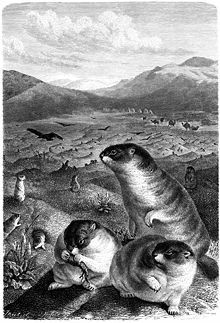 Those members of Marmota most often referred to as marmots tend to live in mountainous areas such as the Rockies and the Sierra Nevada in the United States, the European Alps, and Northern Canada. 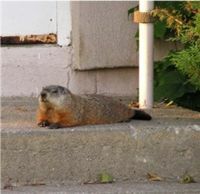 However, the North American groundhog or woodchuck (Marmota monax) is also properly called a marmot. Marmots exhibit bi-level functionality as they meet their own needs for growth, survival, and reproduction while also providing benefits to the larger ecosystem and to humans. Ecologically, marmots, with their abundant reproduction provide a supply of defenseless young pups, which are a source of food for such animals as wolves, foxes, coyotes, and eagles. For humans, marmots historically have been a source of meat and fur, and marmots are included in cave paintings in France dated as mid to late Pleistocene (Karels 2004). However, in agricultural areas, marmots sometimes also are viewed as pests. Some species are considered to be significant vectors of human disease, including the plague (Karels 2004). Marmots are members of the squirrel family, Scuridae, which also includes flying squirrels, tree squirrels, and ground squirrels such as the chipmunk and prairie dog. Sciurids, like all rodents, are noted for their teeth. They have a pair of large incisors on the upper and one on the lower jaw that grow continuously and need to be kept short and sharpened by frequent gnawing. (The word "rodent" comes from the Latin word for "gnawing.") The second pair of incisors, the canines, and the first premolars are missing in rodents, creating a gap between the incisors and the grinding teeth. In most squirrels, the incisors are large and the jaw muscles are strong and well developed. The hindlimbs of sciurids are generally longer than the forelimbs, and they have four or five toes on each foot. Their paws on their forefeet include a thumb, although this is often poorly developed. The feet of sciurids also have a soft pad on the underside (Milton 1984). There are diverse taxonomic schemes for classifying members of the Sciuridae family. Some place the tree squirrels and ground squirrels together in the subfamily Sciruinae and the flying squirrels in the subfamily Pteromyinae (Lurz 2004). Some place the tree squirrels together with the flying squirrels as different tribes within the subfamily Sciurinae, while placing ground squirrels in the subfamily Xerinae. Within the ground-dwelling squirrels, Karels (2004) (who places them within Sciruinae) recognizes three tribes: (1) Xerini (African ground squirrels and a central-Asian ground squirrel); (2) Marmotini (marmots, antelope squirrels, prairie dogs, ground squirrels, and Chinese rock squirrels); and (3) Tamiini (the chipmunks). Regardless of taxonomic scheme, the marmots are classified as those ground-dwelling squirrels that are members of the genus Marmota and they are placed in the tribe Marmotini with chipmunks, prairie dogs, and the ground squirrels. The similarly-sized but more social prairie dog is not classified in the genus Marmota but in the related genus Cynomys. Marmots are generally large ground squirrels. The groundhog (Marmota monax), also known as the woodchuck, is the largest sciurid in its geographical range, typically measuring 40 to 65 centimeters (16 to 26 inches) long (including a 15 centimeter tail) and weighing two to four kilograms (4.5 to nine pounds). In areas with fewer natural predators and large quantities of alfalfa, groundhogs can grow to 80 centimeters (32 inches) and 14 kilograms (31 pounds). 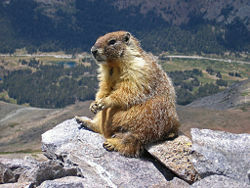 Marmots typically live in burrows, and hibernate there through the winter. Marmots are the largest true hibernating mammal (Karels 2004). A yellow-bellied Marmot near Princeton, British Columbia. Most marmots are highly social, and use loud whistles to communicate with one another, especially when alarmed. 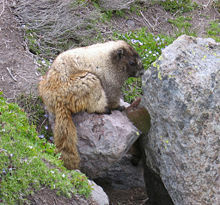 The hoary marmot (Marmota caligata) lives in family groups of up to 35 members, including several females, several cohorts of offspring, and an adult male (Karels 2004). On the other hand, the groundhog (M. monax) is assigned the Latin name monax, for "solitary," because it is the only asocial marmot (except during breeding and raising of the pups) (Karels 2004). Marmots are mainly herbivorous, mainly eating greens. They eat many types of grasses, berries, lichens, mosses, roots, and flowers. However, nearly all ground-dwelling squirrels are omnivorous to a degree (Karels 2004), such as including grubs, grasshoppers, insects, and snails in their diet. Most marmots, such as yellow-bellied and hoary marmots, live in rocky and mountainous areas. 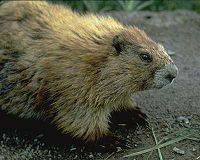 Unlike other marmots, the groundhog (M. monax) is a lowland creature and prefers open country and the edges of woodland. The name marmot comes from French marmotte, from Old French marmotan, marmontaine, from Old Franco-Provençal, from Low Latin mures montani "mountain mouse," from Latin mures monti, from Classical Latin mures alpini "Alps mouse." The following is a list of all Marmota species recognized by Thorington and Hoffman (2005). They divide marmots into two subgenera. Alpine Marmot Marmota marmota Central and Western European Alps, Tatra, introduced into the Pyrenees. Marmots have been an historical source of meat, fat, and fur for early Europeans and a food source for Native Americans and in Asia. The history of human-marmot interaction is a long one, with paintings of marmots in France traced to the mid to late Pleistocene (Karels 2004). During the twentieth century, marmot fur was fashionable in Europe, and it is estimated that Mongolians, who did not use marmot skins traditionally, prepared approximately 132,700 marmot skins a year between 1906 and 1994 (Karels 2004). In his writings, Marco Polo also refers to the marmot, listing them as "Pharaoh's rats." 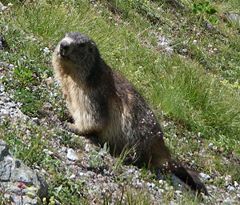 Alpine marmot in the Massif des Écrins, southern France. While marmots, such as the alpine marmot (Marmota marmota), were a source of food for most of the last millennium in Europe, as agriculture increased they not only became less relied on, but became seen as an agricultural pest (Karels 2004). Now the alpine marmot is seen as a symbol of the Alps (Karels 2004). Some ground-dwelling squirrels are known as vectors of human disease. These include marmots in central Asia that are considered a significant carrier of the plague; in Mongolia, marmot hunting is banned in areas known to have plague—although this results in an increase in marmots and the area of the plague (Karels 2004). Some historians suggest that marmots, rather than rats, were the primary carriers of the Bubonic plague or yersinia pestis during several historic outbreaks (Kelly 2005). Through this, marmots are credited with a death toll of over a billion, making them second only to the malarial mosquito as a killer of humans. Marmots are also credited with transmitting numerous coughing ailments to humans. Ecologically, marmots are a source of food for such animals as wolves, foxes, coyotes, bears, and eagles, with the young marmots particularly susceptible to predation. One of the most critically endangered species is the Vancouver Island marmot (Marmota vancouverensis), whose distribution is restricted to Vancouver Island, British Columbia, Canada. In 2002, only 25 animals were known to live in the wild on Vancouver Island (Karels 2004). There are other species in captivity. Armitage, K. B. 1999. Evolution of sociality in marmots. Journal of Mammalogy 80:1-10. Kelly, J. 2005. The shifting explanations for the Black Death, the most devastating plague in human history History News Network April 4, 2005. Retrieved May 11, 2008. Lurz, P. W. W. 2004. Squirrels and relatives III: Tree squirrels. Pages 163 to 173 in B. Grzimek et al., Grzimek's Animal Life Encyclopedia, 2nd edition, vol. 16, mammals V. Detroit, MI: Thomson/Gale. ISBN 0787657921. Milton, K. 1984. Family Sciuridae. Pages 612-623 in D. Macdonald (ed. ), The Encyclopedia of Mammals. New York: Facts on File. ISBN 0871968711. Thorington, R. W., and R. S. Hoffman. 2005. Family Sciuridae. Pages 754-818 in D. E. Wilson and D. M. Reeder (eds. ), Mammal Species of the World: A Taxonomic and Geographic Reference. Baltimore: Johns Hopkins University Press. ISBN 0801882214. This page was last modified on 15 August 2018, at 16:11.